The force that gravity and physical activity put on our bones causes tiny tears in the membranes of the tiny cells that enable us to make or break down bone, scientists say. While that may sound bad, it’s actually a key piece of how the force we put on our bones helps keep them strong, they report in the Journal of Orthopaedic Research. 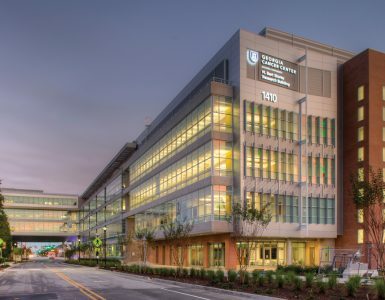 “The bone has to constantly adapt and make sure that it has the right design to withstand the loads you are going to put it through,” says Dr. Meghan E. McGee-Lawrence, biomedical engineer in the MCG Department of Cellular Biology and Anatomy. Osteocytes manage the osteoblasts that make bone as well as the osteoclasts that break bone down and were known to sense mechanical loading, but just how they sensed load was unknown. McGee-Lawrence and MCG cell biologist Dr. Paul McNeil are the first to find the small tears in response to force exacted by walking up the stairs or lifting weights. Not only do the cells experience membrane tears, but it’s the highest number that McNeil, an expert in cell membrane repair, has seen in a variety of cell types. “It’s remarkable,” says the study coauthor. And the heavier the mechanical load, the more tears — for example, the mice walking on a treadmill versus just moving about in their cage. Better understanding the specific mechanism by which these cells sense then respond to mechanical load should enable identification of logical targets for improving the strength and health of aging bones as well as bones challenged by diseases like diabetes, says McGee-Lawrence, the study’s corresponding author. Osteocytes are plentiful in bone, and each has hundreds of tiny processes reaching out in every direction that help secure them to the bone matrix. McGee-Lawrence likens their look to a sweetgum ball. She and McNeil have early evidence the diminutive cells and their projections are both very vulnerable to tearing and that vulnerability appears to make them a natural for responding to mechanical load. Once tears happen to cell membranes, more calcium rushes inside the cells. This mineral closely associated with bone health — and present outside the cell at concentrations 10,000 times higher than inside the cell — was known to be an initiating signal, McNeil says. 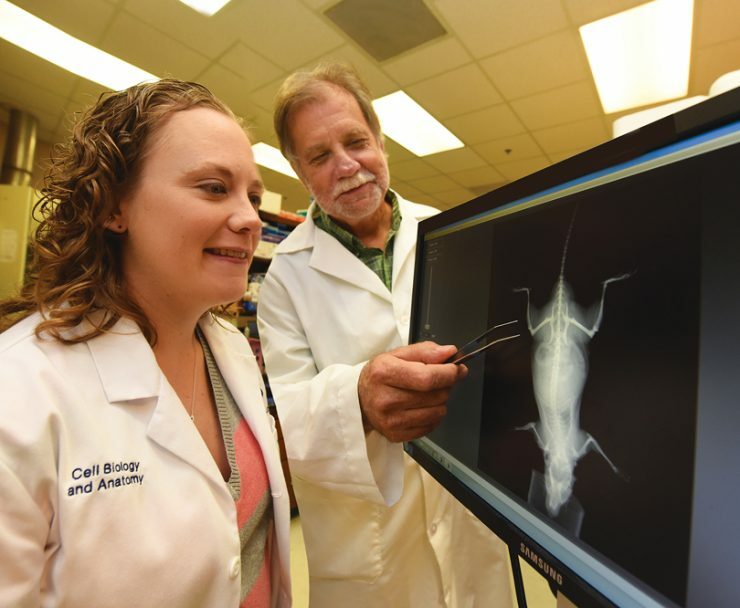 His work has shown how in many cell types, including now osteocytes, the load causes the tears, which allows calcium to rush in to both rapidly heal tears and to set in motion a host of actions that, in this case, remodels bone. 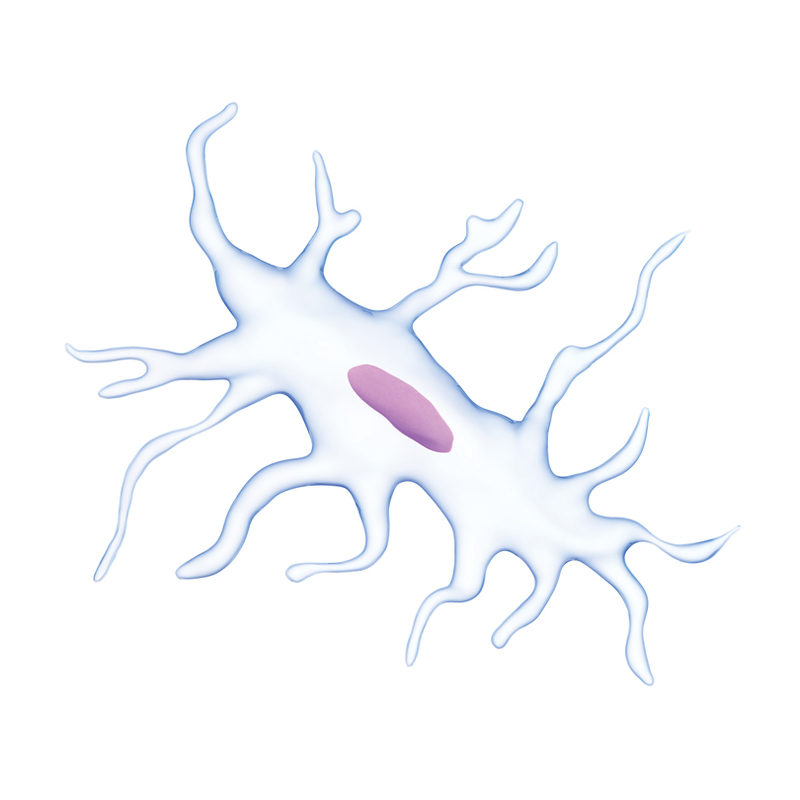 In cell cultures, they watched as increased calcium levels inside osteocytes triggered an increase in the production of the protein c-fos. The protein also is well-studied and known to be involved in the signaling pathways that lead to stronger bones in response to exercise, but c-fos’ connection with membrane tearing was another unknown. Osteocytes use their micron-thin tentacles to communicate with each other, and the scientists also learned that when one osteocyte gets tears, it appears to communicate its load to neighboring osteocytes so the calcium level goes up in those as well even without a tear. The message the torn osteocyte shares tells osteoblasts to make the bones stronger and the osteoclasts to quit breaking bone down. Further shoring up bone makes it likely to be better prepared for whatever mechanical load comes next, McGee-Lawrence says. Conversely, the lack of loading and subsequent tearing may be why astronauts’ bone and muscle weaken in zero gravity, McNeil says. 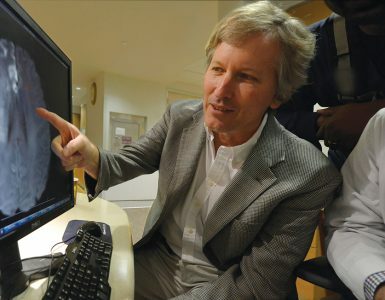 McGee-Lawrence is principal investigator on a new $450,000 National Science Foundation grant that will help them further parse this important puzzle and the potential for enabling better bone health with age and disease. Part of what they are doing with the new grant includes looking at mice with a genetic deficiency in cell membrane repair. 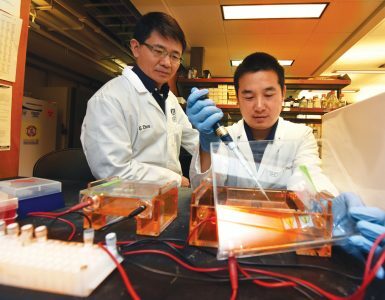 They want to see if the 50-year-old drug poloxamer 188 — which was designed to reduce the thickness of blood, is found in products like toothpaste and has been shown to repair other cell membranes — might help osteocytes remain proficient at responding to mechanical load. Like many of our senses that dull with age, aging osteocytes don’t sense critical mechanical loads as well. “It’s a way you can influence membrane repair rates so if we speed up how fast that tear repairs, is that going to influence the osteocytes?” McGee-Lawrence says. They’ll also look at the impact of slowing repair down. 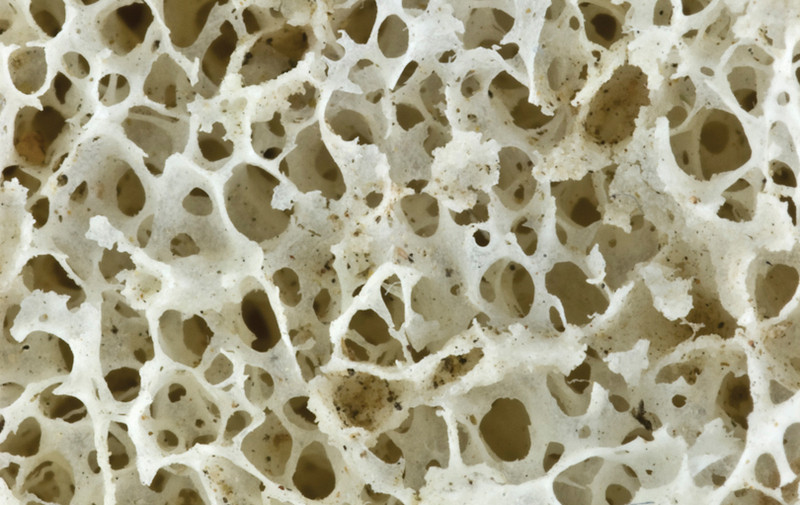 No drug on the market for osteoporosis is known to enhance osteocyte sensitivity. “We are starting to understand why calcium signaling gets initiated in wounded cells, and then that gives us a mechanism we can target to try to influence how well bone detects mechanical loading,” McGee-Lawrence says. Disease may also complicate the common action of cell membrane tear and repair. For example, McNeil has shown that diabetes, which is associated with bone loss, can lead to problems with membrane repair of other cell types. Now the MCG scientists are looking at whether it similarly affects osteocytes. Bone and muscle health are inextricably connected and McNeil has done pioneering work that shows one way we keep our muscles strong and even increase their size is through this process of tear and repair in the membrane of muscle cells. “If you go to the gym and exercise your muscles, they are going to get bigger and stronger, and at the same time if you sit around all day your muscles are going to get weaker,” McGee-Lawrence says. “Bone does the same thing.” McNeil notes the difference between the right and left hands and arms of a right-handed tennis player. “This bone is full of cells. Some are building new bone, some are breaking down bone and it is constantly being remodeled,” McNeil adds, holding up a large muskox bone. People hit their peak bone mass in the late 20s or early 30s. After that, the percentage of osteoblasts to osteoclasts starts to shift so that you are slowly losing rather than building bones. Active youth, they note, tend to build a better bone mass that should comfortably see them into old age, particularly if they remain active. Failure of rapid membrane repair is associated with weaker muscles, even muscle disease, they note, and the scientists expect the same also holds true in bone. Future studies include exploring whether repair failure contributes to common problems like osteoporosis.